Different eras are characterized by a variety of designs - the contemporary period, for example, is represented by a streamlined aesthetic, composed of minimalist designs and a neutral palette. So why do so many people still prefer the look of antiques? 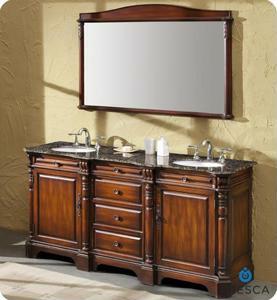 In the bathroom, an antique bathroom vanity is still a popular choice for many traditionalists around the country. Perhaps it's the old world feel of the piece - dark wood carved with intricate detailing is usually complemented by elegantly curved bronze faucets to match. The result is often something that appears to come straight from a room in a Victorian European castle. Of course, the undeniable popularity of an antique bathroom vanity may be rooted in all that it can offer - most pieces resemble furniture composed of several drawers and cabinets so that you can hide your hygienic products and other knickknacks. Whatever the case may be, the appeal of an antique bathroom vanity is unquestionable. If you're planning on purchasing one for your space, it may be important to make sure that the piece will ultimately complement your current design aesthetic.